← Podcast: Is there a ‘Moral Orthodoxy’? The #Luke2Acts study has continued on Twitter over the last couple of weeks (you can see my notes on Luke here). I thought that I would post some notes from chapters 1 and 2 of John. I wasn’t able to say much on these chapters on Twitter, so I thought that I would extensively elaborate on my sparse Twitter notes. Expect notes on the rest of John at some point in the future. Matthew begins his gospel with an overt quotation from the LXX of Genesis: He is writing the βιβλοσ γενεσεωσ of Jesus, just as Genesis records the βιβλοσ γενεσεωσ of heaven and earth (Gen 2:4) and of Adam (5:1). Matthew follows with a genealogy, like the numerous genealogies of Genesis (4:16-26; 5:1-32; 10:1-32; 11:10-32; 36:1-43), recounts a miraculous birth (cf. Isaac, Jacob) to a dreamer named Joseph. John 1:1 takes us back further, back to the very beginning, to Genesis 1:1 and the creation of the world. If Matthew wants us to present Jesus against the backdrop of the story of humanity from its origins, John wants us to look back further still, to see the Word as the Creator of all things, the One who was with God and the One who was God. Just as the first act of creation was the declaration ‘let there be light!’ so the Word is the utterance of God who gives light to all the world. This light, the true Light, enters into the world and the stage is set for a glorious new creation. Creation themes continue throughout the chapter and the book. Leithart and others have suggested that the days mentioned in the first chapter follow the days of the creation (there are various ways of slicing them up). That the name and vocation of the John the Witness—for John is more witness than baptist in the fourth gospel and the title ‘Baptist’ is never given to him within it—features so prominently in the majestic chords with which the symphony of this gospel begins is evidence of his significance. John the Witness plays a similar part to the other John the Witness, mentioned at the beginning of the book of Revelation (Revelation 1:1-2). The first John the Witness witnesses to and prepares people for the first coming of Christ; the second John the Witness witnesses to and prepares people for the second coming of Christ. Revelation 21:2—Then I, John, saw the holy city, New Jerusalem, coming down out of heaven from God, prepared as a bride adorned for her husband. John 1:14-18 displays the importance of the Exodus background for the gospel writers. In a richly evocative statement, within which John encapsulates the fundamental import of his gospel, a number of Exodus themes are alluded to. It is Exodus 33-34 in particular that stands behind John’s text. The specific verb employed in verse 14a is noteworthy as it involves a tabernacle allusion: the presence of the incarnate Word is implicitly compared to the presence of God in the midst of his people in the tabernacle at Sinai (the consonants of the Greek verb also correspond to the Hebrew consonants for the Shekinah glory of God). The reference to the Spirit descending and remaining upon him might also recall Exodus 33:9 and 34:5, where it refers to the descent of YHWH upon the tabernacle or Sinai in the cloud. The fundamental imagery in terms of which John frames the incarnation is drawn from the Exodus. The beholding of the glory of God (v.14b), coupled with the reference to the fact that no one has seen God at any time (v.18a, cf. Exodus 33:20), also suggest an allusion back to the events of Exodus 33 and 34, where God passed before Moses and showed him his glory. The Logos made flesh is described as being ‘full of grace and truth,’ a rough approximation to Exodus 34:6, where God describes himself as ‘abounding in goodness and truth.’ Such an implied parallel relates Christ to God’s revelation of his glory to Moses at Sinai and perhaps by extension to the Angel of the Presence and Glory-Spirit theophanies. This detail would fill out John’s understanding of Christ’s glorious pre-existence and prior activity in the history of Israel (cf. John 8:58; 12:41; 17:5). Christ has been active in Israel’s history all along. Christ is greater than Moses. Moses witnessed the glory of God and acted as an intermediary for the people of Israel. He gave testimony to the glory of God to the people, as did the Law that was given through him. However, Christ is the glory of God, the One whom Moses witnessed. Through Christ we become like Moses: those who encounter God apart from an intermediary. The only begotten Son, who is in the bosom of the Father, has declared him. This is an image of surprising intimacy, and one worth reflecting upon. It is most akin to the image of an infant being held by its parent, or even suckled by its mother. The imagery recurs later in the gospel, in 13:23, as the disciple Jesus loved and the author of the gospel reclined in the bosom of Jesus (see also 13:25, 21:20). The association is significant: the extreme intimacy between the Father and the Son qualifies him as the perfect witness-bearer. Likewise, the great intimacy between Jesus and the disciple that he loved qualifies that disciple to bear witness to him in the gospel that we are reading. The imagery is highly unusual for a man and Revelation 1:13 has even more startling imagery, referring to Jesus’ ‘breasts’. It shouldn’t be so surprising to those who know their Bibles, though. The statements of faith concerning Christ in John 1 are really striking (vv34, 36, 41, 45, 49). I’ve previously commented on verses 35-51 of this chapter here. Nathanael is called from beneath the fig tree symbolizing Israel. Jesus is here presented as Jacob’s ladder (Genesis 28:12), the connection between heaven and earth (John 1:51). This is the third time that Jesus is either explicitly or implicitly presented in theophanic terms within this chapter. In verses 14-18, Jesus is presented as the glorious revelation of God that Moses witnessed upon Mount Sinai. In verses 32-34, John the Witness sees the Spirit descending and remaining upon Jesus in another theophany. In verse 51, Jesus speaks of yet one more theophany, in which Nathanael will see the angels ascending and descending upon Jesus. Perhaps there is also a progression to be observed here: the first theophany is of the descending Word; the second theophany is of the descending Spirit upon the descended Word; the third theophany is of the angels ascending and descending upon the descended Word upon whom the Spirit rests. In Christ, heaven is coming down to earth. Mary is never referred to by name in John’s gospel. She is always ‘Jesus’ mother’ or addressed as ‘woman’. It would be surprising indeed if Mary’s name were unknown to the readers of the gospel, not least because the Beloved Disciple took Mary into his own home (19:25-27). The omission of her name is more likely to be on account of the important symbolic role that she plays. John 2:1 begins ‘on the third day’. Should we see this as a subtle hint of resurrection themes, especially as the precise numbering of the days seems to be both unnecessary and unclear on the surface level of the narrative? In 2:19 there is another reference to three days. Jesus’ answer to his mother is distancing: ‘Woman, what is there between us? My hour has not yet come.’ This might imply a few things: 1. Mary must relate to Jesus more as disciple than as his mother; 2. More significantly, Mary does not realize the weight of her request: by prompting Jesus’ first sign her request sets him on the path that leads him towards the cross. Very significantly, he accepts this. The theme of water and purification is huge in John and recurs several times in the opening chapters. Here the water of the old covenant is replaced by the wine of the new. The new wine is better (cf. Luke 5:39). Over 150 litres of water (now wine) are in the waterpots. It will be a good feast! The master of the banquet would have been different from the host, the bridegroom, and the best man. He would have been chosen by lot, by the hosts, or maybe even by the guests themselves. The turning of water into wine—thanks to Richard Campeau for alerting me to this!—would also seem to be a pretty strong echo of the first plague upon Egypt, in which the waters were turned to blood. Jesus has already been identified as the Passover Lamb and the scene has been set for a new Exodus. However, rather than performing great acts of de-creation, Jesus’ signs herald a glorious new creation. 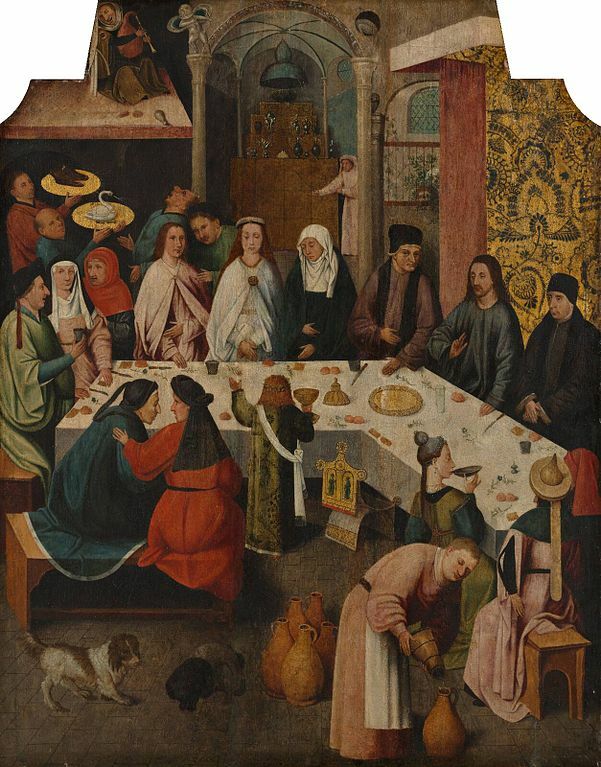 The setting—a wedding feast—the bringing of new wine and the statement of the master of the feast may all suggest that this miracle is a sign of the character of Jesus’ work more generally. He is the bridegroom (cf. 3:29). He replaces the water of old covenant with wine of the new. In the wedding feast of God’s kingdom the best comes later. While the synoptic gospels record temple cleansing in last week of Jesus’ ministry, John records a cleansing at the beginning. I don’t believe that there are two temple cleansings: why has it been moved? First, placing the temple cleansing at this point situates the entire narrative following the first sign under the shadow of the Passion Week. While the other gospels climax in Jerusalem, John is centred upon Jerusalem throughout. Second, it may serve to introduce a symbolic movement through the temple. John 1 presents Christ as the Ark upon which God’s presence rests, as the lamp of the world, and as the altar from which things ascend and descend between heaven and earth. John 2, in presenting Christ as the temple, introduces us to the structure itself. The next chapters focus upon the laver, with their washing and baptismal themes. In the feeding of the five thousand and manna discourse we reach the table of showbread. Chapter 8-9 bring us to the lamp within the temple. In the high priestly prayer of chapter 17 we see the rite of incense. In Christ’s death he passes through the curtain. In chapter 20 we encounter the open Ark in the Holy of Holies of Christ’s tomb (notice the angels on either side). Presenting the temple action later would disrupt this theological sequence. Third, in the other gospels, it is in large part the temple cleansing that precipitates the plot to take Jesus’ life (Mark 11:18; Luke 19:47). Note that Jesus’ words in 2:19 are also found in Matthew 26:61 in the trial leading to his death. By moving forward the cleansing of the temple, the threat to Jesus’ life hangs over the entirety of his public ministry. Also this threat reaches its theological climax, less in the temple action than in Jesus’ action in raising his friend, Lazarus (11:45-57). This allows John to frame Jesus’ death less as the consequence of a prophetic action against the institution of the temple than as the consequence of his self-giving love for his disciple and the world more generally. ‘Zeal for your house will eat me up’ (Psalm 69:9). Jesus’ identity and destiny is bound up with the temple. Jesus’ very body is the temple, God tabernacling among us. The cleansing of the temple is reminiscent of Nehemiah 13:4ff. This entry was posted in #Luke2Acts, Bible, Exodus, Genesis, John, NT, NT Theology, Theological. Bookmark the permalink. Your reference to Spirit theophanies in the O.T. is a good background for the revelation of the Spirit in Jn.1-2. You mention the visionary aspect of John’s witness, when he sees the Spirit descending and remaining on Jesus (1:32). I think the Spirit remaining on Jesus is crucial for understanding his role as not only the one in whom the Spirit remains, but also as the one who will baptize with the Spirit. The same Greek word used for John “seeing” the Spirit (like a dove) was earlier used in 1:14 for “we saw” his glory–the glory of the one who was full of grace and truth. This fullness of grace and truth in Jesus links with the Spirit who remains in Jesus (and who will be described especially as “the Spirit of truth” in the climactic discourse of Jesus in Jn.14-16). Thus this grace and truth will also be “received” by “we all” (1:16), a fullness of “grace upon grace” from Jesus, who baptizes his disciples with the Spirit, who will remain with them (after Jesus departs from the earth). While Moses saw the glory of God, this glory faded away (as Paul describes in 2 Cor. 3). So unlike Moses, and his law (truth), Jesus and his disciples will receive the grace of the glory-Spirit of truth, and this glory will remain with them forever, empowering a life of witness to the new truth Jesus revealed (through his words and deeds). When Jesus reveals his glory to his disciples by turning water into “good” wine (2:11), the wine could be another liquid metaphor for the cloud Spirit, depicted by Jesus in 7:38-39 as living water, which will only be given when he is glorified, when his hour comes. In Jn. 2 his hour has not yet come, but he does this sign that reveals the glory that will be poured out when his hour has come, when he will baptize with the Spirit.